2010, Warner Bros. Directed by Sylvain White. Based on the comic by Andy Diggle & Jock. Running time: 1 hour 37 minutes. PG-13. 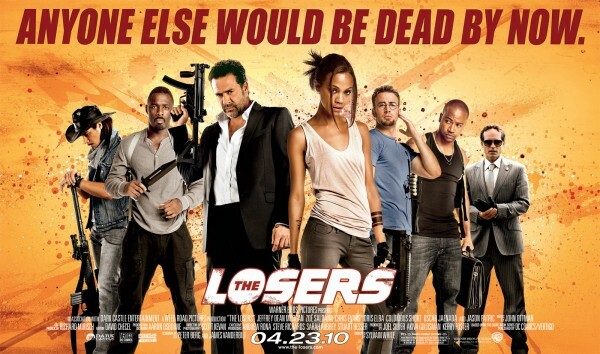 Starring: Jeffrey Dean Morgan, Zoë Saldana, Jason Patric. Helm: I greatly enjoyed this film. Warriors with a code, betrayed by a superior, trying to redeem their lost honor. Numerous explosions, eyes gouged, violent mayhem, exotic locations, high-speed action and plenty of laughs. Unlike you, Mathew, these losers were entertaining. Mathew: Dude. This film was totally predictable. You could see every twist coming a mile off. And it was super derivative. Helm: I saw no twists coming. It felt very original to me. Mathew: That's only because you've barely seen any movies. You were, like hypnotized for 80 years or whatever. But trust me, a lot of the stuff that was done in this movie has totally been done before. Helm: Your laughter was almost as distracting to me as your girlish screams of fear and surprise, and yet you claim you did not enjoy this film? Mathew: Look Helm, I enjoyed it. I admit that. It was fun. It was a good popcorn-eatin' B movie. But it's all pretty standard action movie cliche stuff. Even those two chicks who sat behind us and talked through the whole movie called the outcome of every major scene like five minutes before it happened. Helm: You should have asked them to be silent. I urged you repeatedly. Mathew: Dude. Those chicks looked dangerous. Like they might have been in a gang or something. And people who talk in movies that much are usually crazy. Asking them to be quiet would be like...stupid. But you're distracting us from the review. This movie was predictable. Helm: Even the villain? I enjoyed the villain immensely. Mathew: Okay. Fine. Jason Patric was really funny and inventive as the bad guy. That was a good performance. Heck, all of the performances were good. It was just, you know, a testosterone-fueled, standard-issue-action-movie formula. Helm: And you prefer the estrogen-fueled, womanly-cry-baby formula. Shall I put on Terms of Endearment for you? Mathew: You're a jerk, Helm. Four out of five Flaming Swords!! Helm: Thou art too hard on what is simply an enjoyable action romp! Mathew: You just don't know enough to not like this more.